U.S. stocks edged lower as selling in technology shares overwhelmed an advance by companies poised to benefit from proposed cuts to corporate taxes. The dollar strengthened and oil slumped. The S&P 500 Index reversed gains of as much as 0.9 percent and the tech-heavy Nasdaq fell as investors assessed a rally that’s propelled stocks to numerous records this year. An index of the biggest tech shares slumped to a five-week low as investors switched out of the sector. The yield on benchmark U.S. debt climbed after the Senate’s passage of the legislation early Saturday drew focus away from the investigation into connections between President Donald Trump’s aides and Russia. As the dollar gained, the euro slipped versus most major peers. Traditional safe-haven assets fell, with gold resuming its downward path after a jump on Friday and the yen slumping. West Texas oil fell below $58 a barrel. 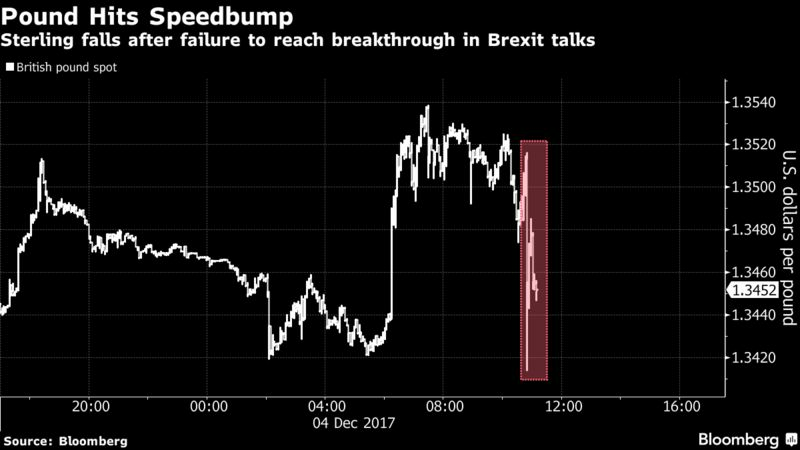 The pound erased gains after Brexit talks ended without a deal. The Stoxx Europe 600 rose the most in five weeks. The MSCI Asia Pacific Index was little changed following a drop for Japan’s Topix and a jump for South Korea’s Kospi. Terminal customers can read more in our Markets Live blog. The European Commission College of Commissioners discusses Brexit on Wednesday and will likely make its recommendation on whether sufficient progress has been made to move negotiations onto the future relationship. The U.S. faces a partial government shutdown after money runs out on Dec. 8 if Congress can’t agree on a spending bill by then. U.S. employers probably hired at a robust pace in November as the unemployment rate held at an almost 17-year low. The Labor Department’s jobs report next Friday may also show a bump up in average hourly earnings. Countries setting monetary policy this week include Australia, Brazil, Canada, India and Poland. The S&P 500 fell 0.1 percent as of the close of trading in New York. The Stoxx Europe 600 Index climbed 0.9 percent. Japan’s Nikkei 225 Stock Average dipped 0.5 percent. The MSCI Emerging Market Index gained 0.6 percent. The U.K.’s FTSE 100 Index increased 0.5 percent. The Bloomberg Dollar Spot Index rose 0.2 percent. The euro decreased 0.3 percent to $1.1855. The British pound slipped 0.1 percent to $1.3464. The Japanese yen sank 0.3 percent to 112.52 per dollar. The yield on 10-year Treasuries rose one basis point to 2.37 percent. Germany’s 10-year yield climbed four basis points to 0.34 percent. Britain’s 10-year yield increased six basis points to 1.28 percent. West Texas Intermediate crude decreased 1.6 percent to $57.40 a barrel. Gold fell 0.3 percent to $1,278.80 an ounce.